Selecting any column from the current value table and seeing a summary of content.. 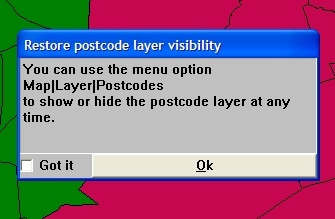 Selecting any combination of that content.. Hitting update.. yes it's that simple.. 1.2.3 done! In this example the content of the whole table is being initially mapped..
.. but with just a few clicks you can rapidly explore ANY combination of critieria from the select column to explore the coverage that results.. If the table contains decimal degrees minutes and seconds geographic coordinates they will be used as the location of the given record. 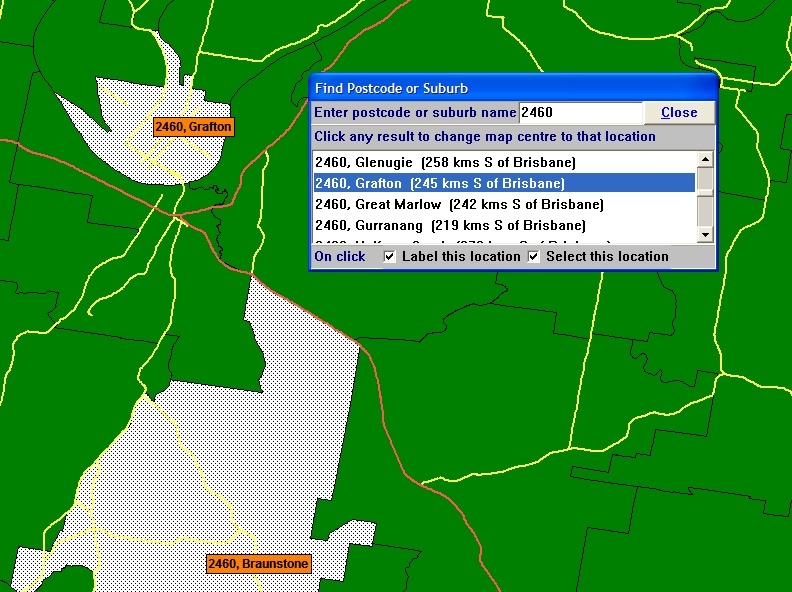 From Postcode only to Suburb or Given Co-ordinates gives a much more detailed and precise mapping of your records as per the following example map. 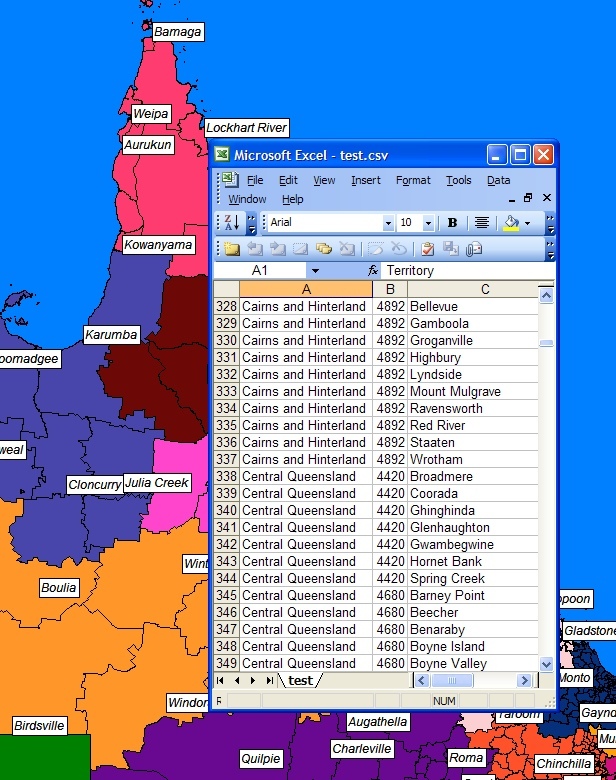 Express export of by-suburb and by-postcode listings of any current territory map. 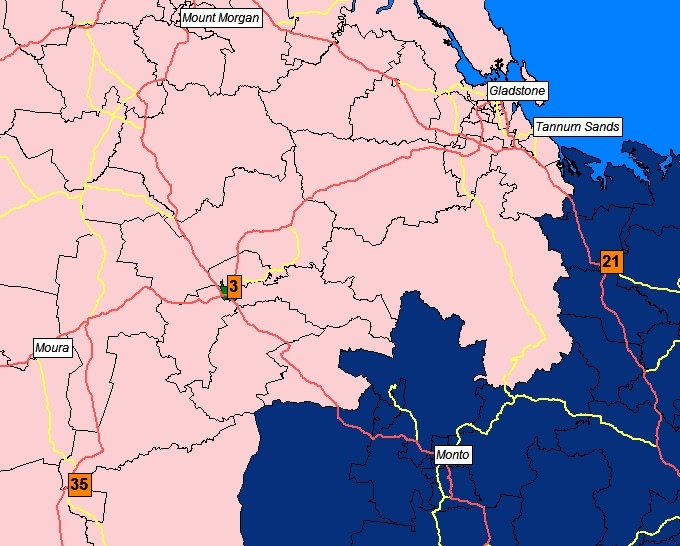 Rapid checking of any current territory map highlights any unallocated areas with a clear label for zoom in and inspection and possible on-the-spot edit as required. New faster and simpler search.. just type it in and click and to jump to there and optionally select and label that location at the same time too. You don't even have to know how to spell the name properly.. pretty handy for those hard-to-remember examples! 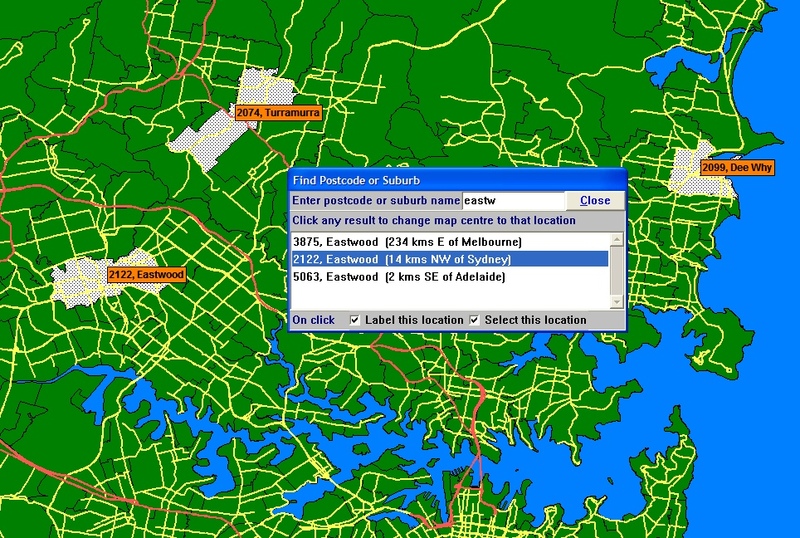 Type in a suburb name and see if there's just one, or more.. or type in a postcode and pick from the suburbs that have that postcode. Convenient hints and tips and offers to do helpful and context sensitive things on yout behalf until you say you "get it". A major menu rationalisation to deliver simplicity, power and consistency with major improvements in accessing just what you want and how you want to use it. With brand new legend facility shows your current filters and symbols. 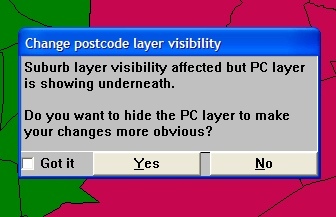 One-click changes and updates. 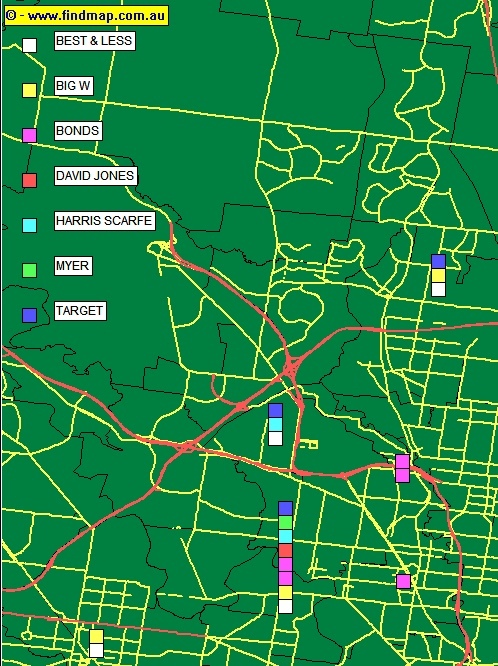 Also with controllable behaviour for points sharing the same location and selection filters such as if in selection, territory, outside of it etc. Everything super fast and saved and restored for you so when re-open the application all at your fingertips to resume where you left off without delay! Even faster and smarter selective point display using content from your tables. Show anything anywhere with your preferred symbol in the blink of an eye. 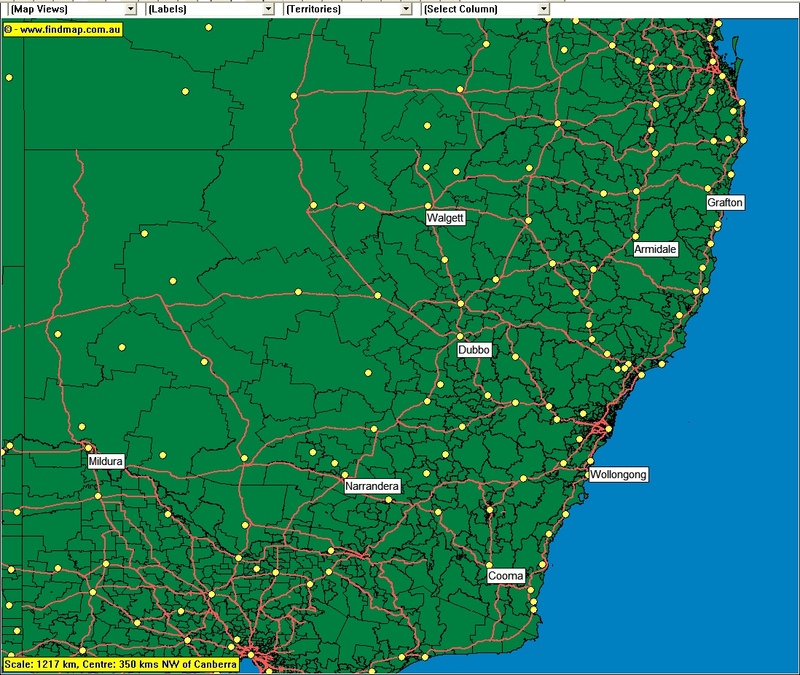 It's now possible to have multiple records geocoded to the same locality precision displayed as a series of stacked symbols to better represent the true point density at that location. Mouseover of any symbol shows the individual record of information. 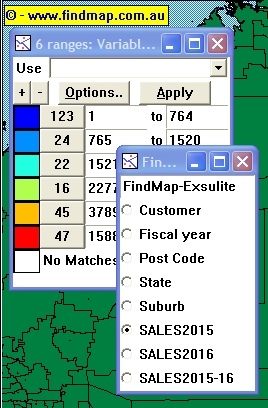 It's now possible to rapidly change columns when mapping by value once a table and legend have been defined. This is very handy to explore differences when you have multiple value columns in a given table. 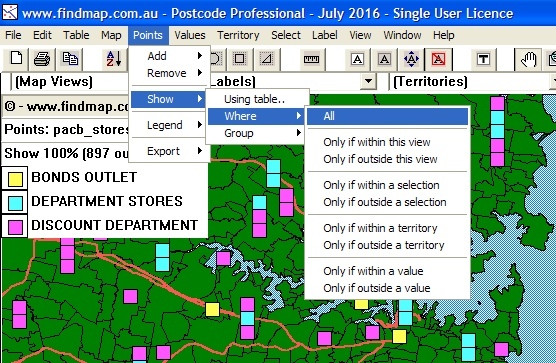 A convenient floating window, which can be moved to any preferred position, is filled with the names of the columns from the current table and all you have to do is to click on a name to re-map using values from that column. A menu is filled with the names of the columns from the current table and all you have to do is to select the name directly from the menu to re-map using values from that column. 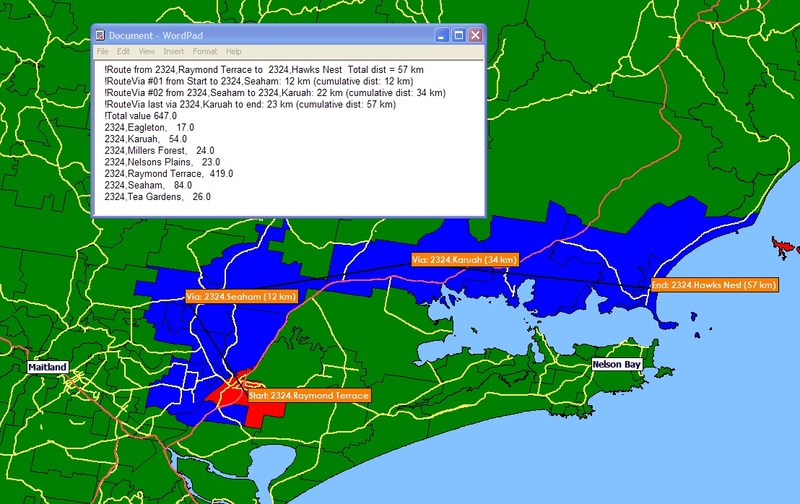 It's now possible, with the optional detailed suburb layer, to switch between simple radius selection and by-road distances to rapidly shape exact territories true to distance and cost to make it a perfect result for your delivery or logistics based business. Click here or map below for more detail..
- 3 levels of point detail with names shown on mouseover. An excellent display and aid for designing territories for example and know exactly what a given postcode will cover when deciding to allocate it or not. 1. 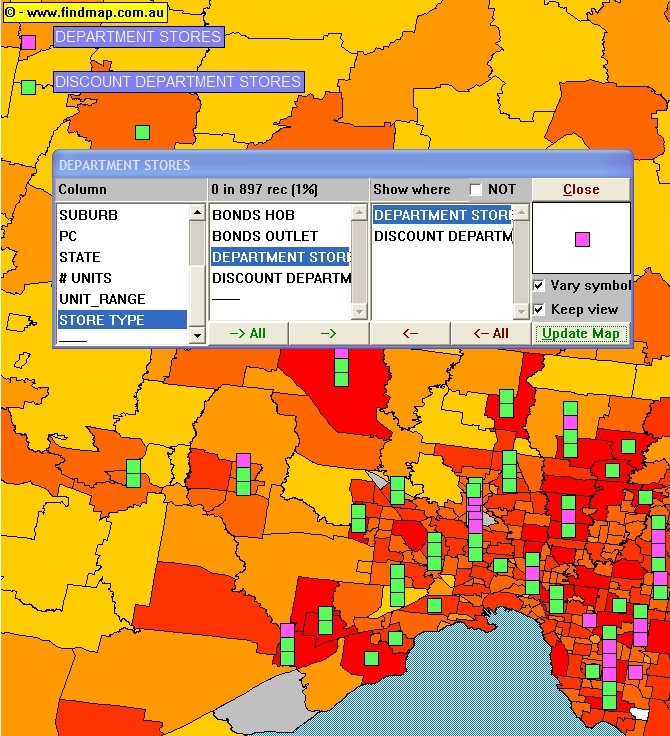 Major towns - Approximately 400 localities for good national and regional overview. 2. 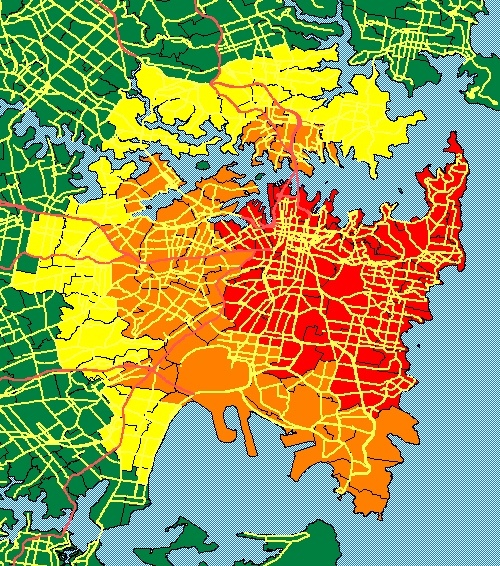 Urban areas - Approximately 1,500 localities showing population centres and urban areas outside of city and metro regions. 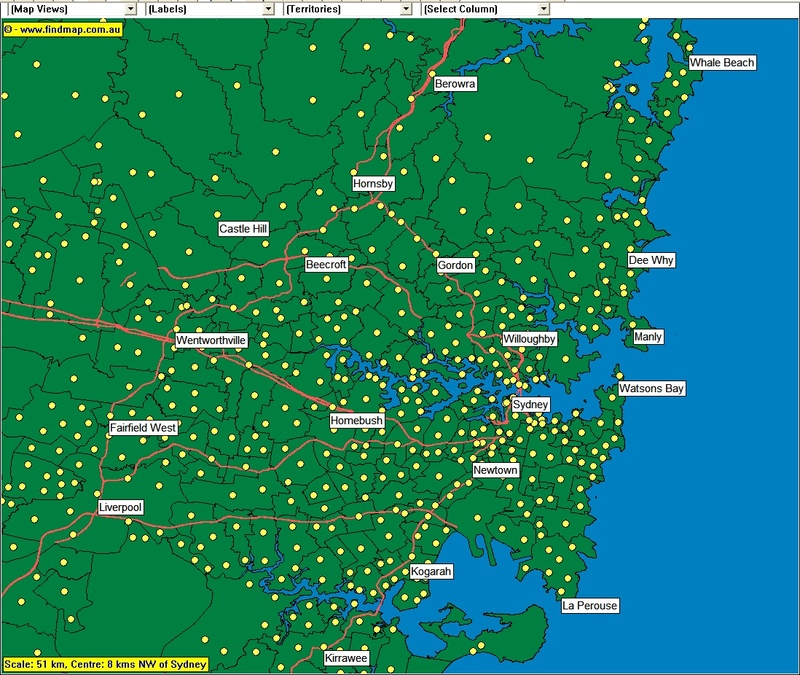 - Map view filterering to import only those records based on location. 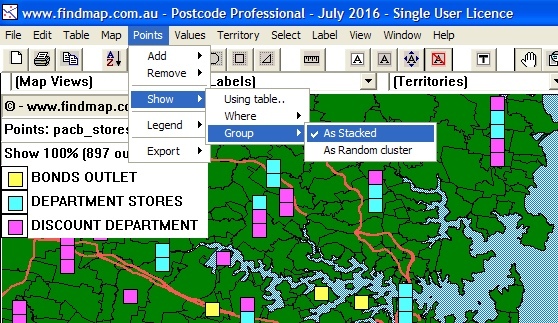 7th June 2015 - With optional suburb layer for Postcode Professional do custom routing and if values are present also do summary statistics, the perfect tool for sending out sales force on the road for maximum efficency and results! 7th June 2015 - With Professional's ability to display points a new search facility makes it easy to filter and find the matches you want, just enter the search text and go! For licensing, trial version request and further information please contact us.